Brandy (from brandywine, derived from Dutch brandewijn — “burnt wine”) is a spirit produced by distilling wine, the wine having first been produced by fermenting grapes. Brandy contains 40%–60% alcohol by volume and is normally consumed as an after-dinner drink. While some brandies are aged in wooden casks, most are coloured with caramel colouring to imitate the effect of such aging. Brandy can also be made from fermented fruit (i.e., other than grapes) and from pomace, the must left over from wine making. Grape brandy is produced by the distillation of fermented grapes. American grape brandy is almost always from California. Popular brands include Christian Brothers, Coronet, E&J, Korbel, and Paul Masson. Armagnac is made from grapes of the Armagnac region in Southwest of France (Gers, Landes, Lot-et-Garonne). It is single-continuous distilled in a copper still and aged in oak casks from Gascony or Limousin. Armagnac was the first distilled spirit in France. Armagnacs have a specificity: they offer vintage qualities. Popular brands are Darroze, Baron de Sigognac, Larressingle, Delord, Laubade, Gélas and Janneau. 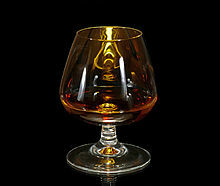 Brandy de Jerez is the brandy from the area of Jerez. As such it is an essential ingredient to Sherry, but it is also available separately. Like Sherry and Cognac it is a Protected Designation of Origin (PDO). The traditional production method has three characteristics: (1) Aged in American oak-wood casks with a capacity of 500 litres, previously having contained Sherry Wine. (2) The sue of the traditional ageing system of Criaderas and Soleras. (3) Aged exclusively within the municipal boundaries of Jerez de la Frontera, El Puerto de Santa María and Sanlúcar de Barrameda, in the province of Cádiz. Cognac comes from the Cognac region in France, and is double distilled using pot stills. Popular brands include Hine, Martell, Rémy Martin, Hennessy, Ragnaud-Sabourin, Delamain and Courvoisier. Portugal: Lourinhã, located in western Portugal, is one of the few brandy-making areas, besides Cognac and Armagnac, that have received appellation status. South African South African grape brandies are, by law, made almost exactly as in Cognac, using a double-distillation process in copper pot stills followed by aging in oak barrels for a minimum of three years. Because of this, South African brandies are of a very high quality. A popular brand is Klipdrift. Other countries: Grape brandy is also produced in many other countries, including Armenia, Bulgaria, Cyprus, Georgia, Germany, Greece, Italy, Mexico, Moldova, and Pakistan. Fruit brandies are distilled from fruits other than grapes. Apples, plums, peaches, cherries, elderberries, raspberries, blackberries, and apricots are the most commonly used fruits. Fruit brandy is usually clear and 80 to 90 proof. It is usually drunk chilled or over ice. Calvados is an apple brandy from the French region of Lower Normandy. It is double distilled from fermented apples. Pomace brandy is produced by fermentation and distillation of the grape skins, seeds, and stems that remain after grapes have been pressed to extract their juice (which is then used to make wine). Examples include the Croatian / Montenegrin / Serbian lozovača (loza), Cypriot zivania, French marc, Georgian chacha, German Tresterbrand, Greek tsipouro, Hungarian törköly, Italian grappa, Bulgarian grozdova, Portuguese aguardente, Romanian rachiu de tescovina and Spanish orujo. Pomace is either fermented, semi-fermented or unfermented. During red wine vinification, the pomace is left to soak in the must for the entire fermentation period and is thus fermented. Fermented pomace is particularly suitable for the production of pomace brandy, as it is soft and dry, and has a high alcohol content. Semi-fermented pomace is produced during rosé wine vinification, where the pomace is removed before the fermentation period is completed, and virgin pomace, which is produced during white wine vinification, is not fermented at all. Both semi-fermented and virgin pomace need to be kept in silos until fermentation is complete. After fermentation is complete the pomace wine is distilled. Alcohol derived from pomace is also used as the traditional base spirit of other liquors from wine-making regions, such as Greek ouzo and other aniseed liquors. Most pomace brandy is not aged or coloured. This page was last edited on 19 July 2017, at 18:04.